If you refer a friend we will give you $2.00 for every friend booked through you. Passenger must give your name and address when they make their reservation and they must travel on the tour. Money will be available one week after departure of the tour. You must register with us in advance if you are interested in this program. Passenger cannot be referred by more than one friend. We can set up a great cruise night for your group FREE OF CHARGE. We bring the food, cruise videos and brochures. Let us know what cruise you would like to travel on. For every 15 passengers that sign up you get a free cruise. That's all you have to do. We do all the work and you travel for free! Want to be a group leader? 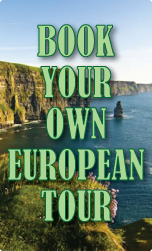 If your organization wants to travel as a group we can arrange any type of tour. Red Sox/Yankees at Yankee Stadium, Broadway Show, Radio City Rockettes Christmas Show in New York or Boston, or any of our tours on dates you choose. *Book the whole bus (40 persons) and you get an extra $100.00! Don't have a group? Start with your church, school, or workplace. We can help you get started.